Abstract: The Crossing East Oral Histories, Interviews and Transcripts presents a view into the lives of Asian and Pacific Islander Americans throughout United States history. The collection contains the digital interviews and transcripts collected during 2004-2006 for the Crossing East public radio series of eight original one-hour documentaries that aired on 230 public radio stations nationally from 2006-2007. Copyright: The copyright interests in this collection remain with MediaRites Productions. Collection materials are for nonprofit, educational purposes only. For broadcast and reprint uses, contact MediaRites for permission. In 1984, MediaRites Productions was established as a nonprofit organization operating out of Portland, Oregon. They strive to promote an understanding among diverse communities through the arts, education and media projects. MediaRites Productions focuses on creating and distributing original work that tells true life stories and how those stories can, by increasing understanding across communities, ultimately improve society for us all. Their award-winning work focuses on unrepresented peoples such as recent immigrants, disabled youth, the homeless, or those with terminal illness. 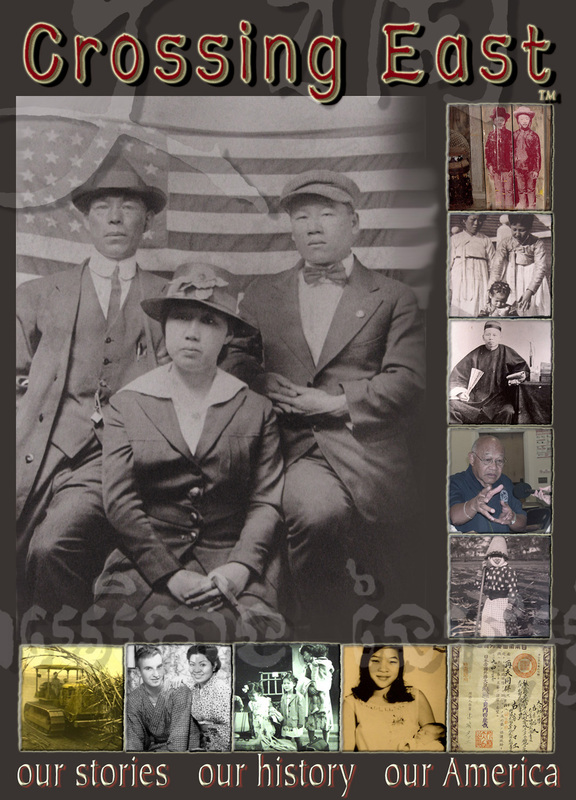 The records of the Crossing East Asian and Pacific Islander American history series include audio and transcripts of interviews and oral histories with scholars, community experts, elders and community members. The interviews were conducted between January 1, 2004 and February 1, 2006. The records contain more than 200 hours of interviews which were used to create the Crossing East public radio series of eight original one-hour documentaries that aired on 230 public radio stations nationally from 2006-2007. The audio and transcripts for interviews is organized by radio show and segment. Also included in the collection, unaired interviews not included in the programs and the music accompaniments. Interviews range from scholar accounts of historical events to personal stories and histories. Notable interviews include those with actor, George Takei and with scholars and experts: Judy Yung, Jeffrey Barlow, Dia Cha, Catherine Ceniza Choy, Bill Ong Hing, Franklin Odo, Gary Okihiro, Jaideep Singh, Ronald Takaki, Linda Trinh Vo, Ji-Yeon Yuh, Jack Tchen, Ah Quon McElrath, Barbara Kawakami, Bill Puette, Lee Tonouchi, Valarie Kaur, Bruce LaBrack, Professor Dawn Bohulano Mabalon, Betty Tisdale, Nguyen Qui Duc, Senator Mee Moua, Alberta Lee and family of Wen Ho Lee, Helen Zia, Reverend Norman Fong, Edward Chang, Angela Oh, Aqueela Sherrills, Sharmala Rudrapa, Shavali Shah, and Yuri Kochiyama. Musicians’ performances in the collection include: Angelo Pizarro (guitarist and composer), Wilma Pang (Professor at San Francisco City College), Ledward Kaapana (Master Slack Key Guitarist), Russel Baba and Jeannie Aiko Mercer of Shasta Taiko , Jared Rehberg (Singer/Songwriter), Jon Jang (Jazz Pianist), Daran Kravanh (Accordionist) and Aishwarya Venkataraman (Violinist).